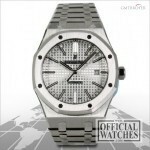 Official Watches was founded in October 2006 by Dino Costas and Luca Lucas. Dino had already been in the jewellery business for over 10 years and Luca came from a retail designer fashion management background after more than 10 years in that industry. Add to this the fact that they were both passionate watch enthusiasts from a young age and collectively, they brought a rich variation of skills to the luxury watch market. Case material: Titanium; Charge: Automatic; Conditions: Never worn Year : 2014; Presentation condition : With dealer guarantee ; Place: United Kingdom, London Model: RM011 Price on request Official Watches Reference: RM011AKTI T his gents Richard Mille RM011 FELIPE MASSA TEXAS GP RM011 AK TI watch is in unworn condition and was registered in 2014 and has a 50 mm case size. 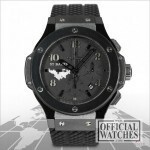 It comes with a transparent dial, has a titanium watch case and a rubber bracelet which fastens with a double-fold clasp. The movement of this watch is automatic. The glass on this watch is made of sapphire glass. The model number of this Gents watch is RM011 AK TI. This Richard Mille RM011 FELIPE MASSA TEXAS GP RM011 AK TI watch is water resistant down to 50 meters and has the following functions: . It also has the following extra features: . This watch also comes with an Official Watches 12 Month Warranty, comes with box and papers. This watch is in stock and available to view in either our North London showroom or by appointment in our Mayfair Office, London, UK. Please quote OW41091 in all communication with us regarding this piece. Case material: Ceramic; Charge: Automatic; Conditions: Never worn Year : 2007; Presentation condition : With dealer guarantee ; Place: United Kingdom, London Model: Big Bang Price on request Official Watches Reference: 301.CM.131.RX.LUN06 T his gents Hublot Big Bang LUNA ROSSA 301.CM.131.RX.LUN06 watch is in mint condition and was registered in 2007 and has a 44 mm case size. 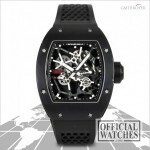 It comes with a black dial, has a ceramic watch case and a rubber bracelet which fastens with a fold clasp. The movement of this watch is automatic. The glass on this watch is made of sapphire glass. The model number of this Gents watch is 301.CM.131.RX.LUN06. This Hublot Big Bang LUNA ROSSA 301.CM.131.RX.LUN06 watch is water resistant down to 100 meters and has the following functions: Chronograph & Date. It also has the following extra features: Display Back, luminescent hands & Luminous indexes. This watch also comes with an Official Watches 12 Month Warranty, comes with box and papers. This watch is in stock and available to view in either our North London showroom or by appointment in our Mayfair Office, London, UK. Please quote OW41421 in all communication with us regarding this piece. Case material: Platinum; Charge: Automatic; Conditions: Never worn Year : 2015; Presentation condition : With dealer guarantee ; Place: United Kingdom, London Model: Royal Oak Offshore Price on request Official Watches Reference: 26401PO.OO.A018CR.01 T his gents Audemars Piguet Royal Oak Offshore Ceramic 26401PO.OO.A018CR.01 watch is in unworn condition and was registered in 2015 and has a 44 mm case size. 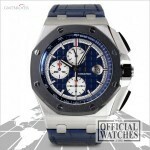 It comes with a blue dial, has a platinum watch case and a leather bracelet which fastens with a buckle. The movement of this watch is automatic. The glass on this watch is made of sapphire glass. The model number of this Gents watch is 26401PO.OO.A018CR.01. 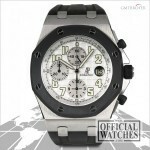 This Audemars Piguet Royal Oak Offshore Ceramic 26401PO.OO.A018CR.01 watch is water resistant down to 100 meters and has the following functions: Chronograph & Date. It also has the following extra features: Display Back, luminescent hands, Luminous indexes & Screw-Down Crown. This watch also comes with an Official Watches 12 Month Warranty, comes with box and papers. This watch is in stock and available to view in either our North London showroom or by appointment in our Mayfair Office, London, UK. Please quote OW41180 in all communication with us regarding this piece. Case material: Yellow gold; Charge: Automatic; Conditions: Never worn Year : 2014; Presentation condition : With dealer guarantee ; Place: United Kingdom, London Model: Sky-Dweller Price on request Official Watches Reference: 326935 T his gents Rolex Sky Dweller 326935 watch is in mint condition and was registered in 2014 and has a 42 mm case size. It comes with a ivory dial, has a pink gold watch case and a pink gold bracelet which fastens with a fold clasp. The movement of this watch is automatic. The glass on this watch is made of sapphire glass. The model number of this Gents watch is 326935. This Rolex Sky Dweller 326935 watch is water resistant down to 100 meters and has the following functions: Date, GMT & Month hand. It also has the following extra features: center seconds, luminescent hands, Rotating Bezel & Screw-Down Crown. This watch also comes with an Official Watches 12 Month Warranty, comes with box and papers. This watch is in stock and available to view in either our North London showroom or by appointment in our Mayfair Office, London, UK. Please quote OW41050 in all communication with us regarding this piece. Case material: Yellow gold; Charge: Automatic; Conditions: Never worn Year : 2014; Presentation condition : With dealer guarantee ; Place: United Kingdom, London Price on request Official Watches Reference: UR-110 T his gents Urwerk UR-110 RG UR-110 watch is in mint condition and was registered in 2014 and has a 51 mm case size. 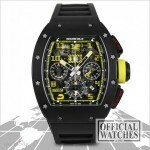 It comes with a black dial, has a pink gold watch case and a gold/steel bracelet which fastens with a double-fold clasp. The movement of this watch is automatic. The glass on this watch is made of sapphire glass. The model number of this Gents watch is UR-110. This Urwerk UR-110 RG UR-110 watch is water resistant down to 30 meters and has the following functions: . It also has the following extra features: luminescent hands, Luminous indexes, Power Reserve Display & Small Seconds. This watch also comes with an Official Watches 12 Month Warranty, comes with box and papers. This watch is in stock and available to view in either our North London showroom or by appointment in our Mayfair Office, London, UK. Please quote OW41406 in all communication with us regarding this piece. Case material: Steel; Charge: Automatic; Conditions: Never worn Year : 2014; Presentation condition : With dealer guarantee ; Place: United Kingdom, London Model: Royal Oak Offshore Price on request Official Watches Reference: 25940SK.OO.D002CA.02.A T his gents Audemars Piguet Royal Oak Offshore 25940SK.OO.D002CA.02.A watch is in unworn condition and was registered in 2014 and has a 42 mm case size. 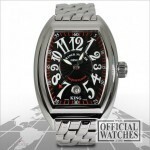 It comes with a silver dial, has a stainless steel watch case and a rubber bracelet which fastens with a fold clasp. The movement of this watch is automatic. The glass on this watch is made of sapphire glass. The model number of this Gents watch is 25940SK.OO.D002CA.02.A. This Audemars Piguet Royal Oak Offshore 25940SK.OO.D002CA.02.A watch is water resistant down to 100 meters and has the following functions: Chronograph & Date. It also has the following extra features: luminescent hands, Luminescent Numerals & Screw-Down Crown. This watch also comes with an Official Watches 12 Month Warranty, comes with box and papers. This watch is in stock and available to view in either our North London showroom or by appointment in our Mayfair Office, London, UK. Please quote OW40934 in all communication with us regarding this piece. Case material: Steel; Charge: Automatic; Conditions: New Year : 2008; Presentation condition : With dealer guarantee ; Place: United Kingdom, London Model: Conquistador Price on request Official Watches Reference: 8005SCKING T his mens Franck Muller Conquistador King 8005 SC KING watch is in fine condition and was registered in 2008 and has a 40 mm case size. It comes with a black dial, has a stainless steel watch case and a stainless steel bracelet which fastens with a double-fold clasp. The movement of this watch is automatic. The glass on this watch is made of sapphire glass. The model number of this mens watch is 8005 SC KING. This Franck Muller Conquistador King 8005 SC KING watch is water resistant down to 100 meters and has the following functions: & Date. It also has the following extra features: center seconds, luminescent hands, Luminescent Numerals & Screw-Down Crown. This watch also comes with an Official Watches 12 Month Warranty, comes with box and papers. This watch is in stock and available to view in either our North London showroom or by appointment in our Mayfair Office, London, UK. Please quote OW3395 in all communication with us regarding this piece. 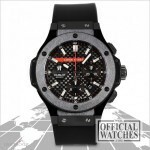 Case material: Ceramic; Charge: Automatic; Conditions: Never worn Year : 2006; Presentation condition : With dealer guarantee ; Place: United Kingdom, London Model: Big Bang Price on request Official Watches Reference: 301.CI.134.RX T his mens Hublot Big Bang ST BARTH 301.CI.134.RX watch is in mint condition and was registered in 2006 and has a 44 mm case size. It comes with a dial, has a ceramic watch case and a rubber bracelet which fastens with a fold clasp. The movement of this watch is automatic. The glass on this watch is made of sapphire glass. The model number of this mens watch is 301.CI.134.RX . This Hublot Big Bang ST BARTH 301.CI.134.RX watch is water resistant down to 100 meters and has the following functions: Chronograph & Date. It also has the following extra features: & Display Back. This watch also comes with an Official Watches 12 Month Warranty, comes with box and papers. This watch is in stock and available to view in either our North London showroom or by appointment in our Mayfair Office, London, UK. Please quote OW3296 in all communication with us regarding this piece. Case material: Steel; Charge: Automatic; Conditions: Never worn Year : 2014; Presentation condition : With dealer guarantee ; Place: United Kingdom, London Model: Datejust II Price on request Official Watches Reference: 116334 T his gents Rolex Datejust II 116334 watch is in mint condition and was registered in 2014 and has a 41 mm case size. It comes with a silver dial, has a stainless steel watch case and a stainless steel bracelet which fastens with a fold clasp. The movement of this watch is automatic. The glass on this watch is made of sapphire glass. The model number of this Gents watch is 116334. This Rolex Datejust II 116334 watch is water resistant down to 100 meters and has the following functions: . It also has the following extra features: center seconds, luminescent hands, Luminescent Numerals & Screw-Down Crown. This watch also comes with an Official Watches 12 Month Warranty, comes with box and papers. This watch is in stock and available to view in either our North London showroom or by appointment in our Mayfair Office, London, UK. Please quote OW40802 in all communication with us regarding this piece. Case material: Steel; Charge: Automatic; Conditions: Never worn Year : 2015; Presentation condition : With dealer guarantee ; Place: United Kingdom, London Model: Royal Oak Price on request Official Watches Reference: 15400ST.OO.1220ST.02 T his gents Audemars Piguet Royal Oak 41mm 15400ST.OO.1220ST.02 watch is in unworn condition and was registered in 2015 and has a 41 mm case size. It comes with a silver dial, has a stainless steel watch case and a steel bracelet which fastens with a double-fold clasp. The movement of this watch is automatic. The glass on this watch is made of sapphire glass. The model number of this Gents watch is 15400ST.OO.1220ST.02. This Audemars Piguet Royal Oak 41mm 15400ST.OO.1220ST.02 watch is water resistant down to 50 meters and has the following functions: . It also has the following extra features: Display Back, luminescent hands, Luminous indexes & Screw-Down Crown. This watch also comes with an Official Watches 12 Month Warranty, comes with box and papers. This watch is in stock and available to view in either our North London showroom or by appointment in our Mayfair Office, London, UK. Please quote OW41366 in all communication with us regarding this piece. 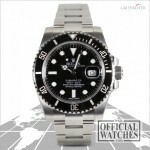 Case material: Steel; Charge: Automatic; Conditions: Never worn Year : 2015; Presentation condition : With dealer guarantee ; Place: United Kingdom, London Model: Submariner Price on request Official Watches Reference: 116610LN T his gents Rolex Submariner Date 116610 LN watch is in unworn condition and was registered in 2015 and has a mm case size. It comes with a black dial, has a stainless steel watch case and a stainless steel bracelet which fastens with a fold clasp. The movement of this watch is automatic. The glass on this watch is made of sapphire glass. The model number of this Gents watch is 116610 LN. This Rolex Submariner Date 116610 LN watch is water resistant down to 300 meters and has the following functions: . It also has the following extra features: center seconds, luminescent hands, Luminous indexes, Rotating Bezel & Screw-Down Crown. This watch also comes with an Official Watches 12 Month Warranty, comes with box and papers. This watch is in stock and available to view in either our North London showroom or by appointment in our Mayfair Office, London, UK. Please quote OW41159 in all communication with us regarding this piece. Case material: Steel; Charge: Manual; Conditions: New Year : 2012; Presentation condition : With dealer guarantee ; Place: United Kingdom, London Model: RM035 Price on request Official Watches Reference: RM035ALALMG T his gents Richard Mille RM035 RAFAEL NADAL RM035 AL ALMG watch is in fair condition and was registered in 2012 and has a 39.7 mm case size. 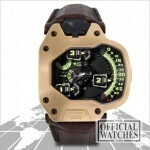 It comes with a transparent dial, has a aluminum watch case and a rubber bracelet which fastens with a double-fold clasp. The movement of this watch is manual winding. The glass on this watch is made of sapphire glass. The model number of this Gents watch is RM035 AL ALMG. This Richard Mille RM035 RAFAEL NADAL RM035 AL ALMG watch is water resistant down to 50 meters and has the following functions: . It also has the following extra features: center seconds, luminescent hands, Luminous indexes & Skeletonized. This watch also comes with an Official Watches 12 Month Warranty, comes with box and papers. This watch is in stock and available to view in either our North London showroom or by appointment in our Mayfair Office, London, UK. Please quote OW41040 in all communication with us regarding this piece.